After spending hours creating an Organizational Structure, it is rather silly to recreate that for each environment you have for testing purposes. One simple solution to that vs doing an entire system company is to use a standard delivered tool from SAP. This tool could be used in several different way, we'll get that into that in a bit. SAP deliver a really neat tool called "Manual Transport Link". You can access it via transaction SE38 and progam name RHMOVE30. What this program does is allowing you to capture PD/OM objects and place it in a transport you can easily release and apply to other clients / systems. To start, let say for example you want to transport organizational structure and all positions below it. WIth that, you will start with creating 1 transport containing all O objects. Specify the O objects, all for reporting period, and add it to the transport. To specifically capture the position, specify the evaluation path in the selection paramters for it to find the position and add that to the transport. Do some trial and error testing of this in a sandbox environment with different selection variations to see how it operate. You might find the best combination that fit your needs. 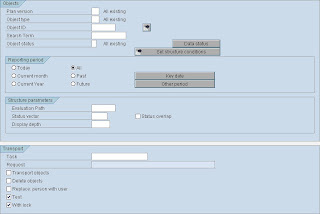 I was at a SAP implementation with the production orgranizational structure was maintained in a DEV environment during the lifecycle of the project. Using this allows you to transports exactly how production structure will look like to all your environment. Thus easily replicating conversion cycles multiple times and cutting the time out from converting OM objects. Pretty neat huh? !